Joseph F. Healey has pointed out that White ethnic identities are evolving into new shapes and forms, merging the various “hyphenated” ethnic identities into a single, generalized “European American” identity based on race and a common history of immigration and assimilation. In the light of the fact that virtually every minority group has generated a protest movement (Black Power, Red Power, Chicanismo, etc. ), proclaiming a recommitment to its own heritage and to the authenticity of its own culture, European Americans also need some space to express their ethnic heritage. St. Patrick’s Day, Columbus Day, and Leif Erikson Day are festive occasions that White Americans should seize in order to honor their rich history and heritage. we remember that son of Iceland and grandson of Norway for his journey to North America, and we celebrate the influential role Nordic Americans have played in our society. Leif Erikson was among the world’s greatest and most daring explorers. More than 1,000 years ago, he led a crew across the Atlantic to North America. … America is grateful for the many contributions of Nordic Americans, and we continue to draw inspiration from the courage and optimism of the adventurous Leif Erikson. The discovery of new lands in the West by the Northmen came about in the course of the great Scandinavian exodus of the 9th, 10th and 11th centuries when Vikings “swarmed over all Europe,” conquering kingdoms, founding colonies and empires. In these centuries waterborne Vikings exploded out of their native lands to trade, raid, and settle all the way “from the Pillars of Hercules to the Ural Mountains.” The main stream of Norsemen took a westerly course, striking Great Britain, Ireland and the Western Isles, and ultimately reached Iceland (in 874a.d. ), Greenland (in 985) and North America (in 1000). Leif Erikson’s father, Erik the Red, was the founder of the first European settlement on Greenland. Tradition reports that he gave the island its name as a marketing strategy designed to disguise its harsh environment and make it attractive to would-be colonists. Erik the Red’s father, Thorvald, left Norway for western Iceland with his family, having been exiled for manslaughter. When Erik was similarly outlawed and exiled from Iceland about 980, he decided to explore the land to the west (Greenland), across 175 miles (280 km) of water. The settlers encountered no other inhabitants, though they explored to the northwest, discovering Disko Island. Of the 25 ships that sailed from Iceland, only 14 ships and 350 colonists are believed to have survived to reach their destination – an area later known as Eystribygd (Eastern Settlement). By the year 1000 there were an estimated 1,000 Scandinavian settlers in the colony, but an epidemic in 1002 considerably reduced the population. The second of three sons of Erik the Red, Leif Erikson (d. 1025) sailed from Greenland to Norway in the year 999 AD, and was there converted to Christianity by the Norwegian king Olaf Tryggvason, and Leif “the Lucky” Erikson joined the king’s body-guard. The following year Leif was commissioned by Olaf to urge Christianity upon the Greenland settlers. On returning to Greenland, he proselytized for Christianity and converted his mother, who built the first Christian church in Greenland. By 1053 the Christian church was well enough established to warrant inclusion in the Archbishopric of Hamburg–Bremen since Pope Leo IX includes it in a bull dated 6 January 1053, the earliest known reference to Greenland by name. According to the “Saga of the Greenlanders” in the Flateyjarbók, Leif learned of Vinland from the Icelander Bjarni Herjulfsson, who 14 years earlier had become the first European to sight mainland America when his Greenland-bound ship was blown westward off course. He apparently sailed along the Atlantic coastline of eastern Canada but did not go ashore. In the year 1000 AD a crew of 35 men led by Leif Eriksson set out to find the land sighted by Bjarni. The sagas refer to three territories: Helluland (“Flat-Stone Land”, probably Baffin Island), Markland (“Wood Land”, probably Labrador) and Vinland – usually thought to have been located in the area around the Gulf of St Lawrence, possibly New England or New Brunswick. In 1003 Leif’s brother Thorvald led an expedition to Vinland and spent two years there. 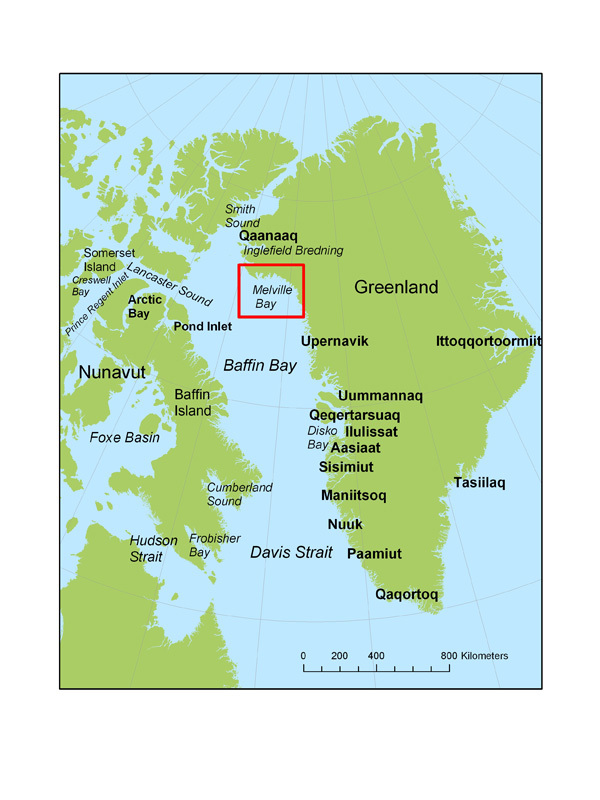 A couple of years later, Thorfinn Karlsefni, encouraged by Thorvald’s reports of grapes growing wild in Vinland, led a colonizing expedition of about 130 people in three ships to Vinland, possibly making their first landfall at Baffin Island. They followed the coastline southward until they reached a heavily wooded region, perhaps some part of the Gulf of St. Lawrence, and settled there. According to some reports, “there came no snow” in the land which the Wineland explorers had found, indicating that they reached a territory farther south than usually assumed. Thorfinn Karlsefni’s wife Gudrid (the widow of Leif’s brother Thorstein) gave birth to their son, Snorri (born c. 1005) – the first European in recorded history to be born on the North American mainland. By the time they had stayed there three years, the colonists’ trade with the local Native Americans had turned to warfare, and so the colonists returned to Greenland. He [the king of the Danes] spoke also of yet another island of the many found in that ocean [where Greenland lies]. It is called Vinland because vines producing excellent wine grow wild there. That unsown crops also abound on that island we have ascertained not from fabulous reports but from the trustworthy relation of the Danes. Beyond that island, he said, no habitable land is found in that ocean, but every place beyond it is full of impenetrable ice and intense darkness. Despite the failure of their efforts to establish a permanent presence in North America, the Norse did make later visits to Vinland to secure materials, and stray finds have turned up in the excavation of native American sites, including a late eleventh-century Norwegian coin found on the central Maine coast (the coin was minted in Norway between 1065 and 1080 during the reign of King Olaf Kyrre). An Icelandic chronicle, Skálholtsannáll (1347), makes reference to a Greenlandship that had been to Markland on a timber-gathering expedition. Timber for shipbuilding was crucial to the Norse as both Iceland and Greenland were largely deforested. During the Viking Age (roughly 800–1100), the Vikings played a decisive role in the development of much of Western and Eastern Europe. War was a means of social engineering in a world that lacked rigid social hierarchies. It was, in the words of Clifford R. Backman, a brutal sort of meritocracy. In the long run, this meant that the Germanic groups were led by men with talents for ferocity and ambition. In the east the Vikings sailed down the great rivers of Russia to cross the Black Sea and the Caspian Sea to attack Constantinople and the Abbasid Caliphate. Vikings settled extensively in the British Isles, Normandy and, to a lesser extent, in Russia but they also pushed the limits of the known world, crossing the North Atlantic to settle in the uninhabited Faeroe Islands, Iceland and Greenland and to discover, but fail to settle, North America. Viking traders and hunters extended the limits of the known world even further, sailing far into the Arctic waters of the White Sea and exploring the west coast of Greenland as far north as Melville Bay in search of walrus ivory and hides. Access to the relevant mode of transport — ships — was of critical importance to the Vikings, and ships were expensive. It was for this reason that colonization of the North Atlantic was led by aristocrats: Only they could afford the necessary ships. As buoyant and flexible as a longship, but a good deal broader, the so-calledknorr carried twenty tons and fifteen to twenty people, and with a good wind and a friendly sea it could sail at six knots, a respectable pace as recently as the Napoleonic Wars. Ship-building was the craft that gave the Vikings their terrifying power and enabled them to span a quarter of the globe with an ease unparalleled until modern times. … The long sea-voyages, and especially the transatlantic explorations, were made not in the famous longship (langskipr) but in the rounder merchant vessel (knorr, whence Irish cnairr), and mainly by sail. … [I]t is estimated that the larger Viking ships carried crews of forty or sixty men, while later, in the eleventh century, royal ships — such as those of Cnút, or the Great Serpent of Olaf Tryggvason — held a hundred men. The Viking ships provided models for imitation elsewhere, as in the case of Alfred the Great’s langscipu — sometimes described as the first attempt to establish a Royal Navy. The skalds of King Cnut — who built a North Sea empire stretching from Dublin, via Scotland and Scandinavia, to the Baltic — advertised their prince’s ships as a symbol of power, a technological advance as revolutionary in the first decades of the eleventh century as ‘dreadnoughts’ were in the opening years of the twentieth. [A]lthough nineteenth- and twentieth-century writers have tended to regard the ‘Viking Age’ as a distinct period of history, it is arguable that the Viking raids were only the culmination of a much longer period of empire-building among the Germanic tribes that inhabited the Scandinavian peninsula, a process that found its beginnings at the start of the first millennium in what is now known as the Roman Iron Age. The beginning of this process was the re-alignment of military strategy that took place in the Roman Empire as a consequence of the Battle of Teutoburg Forest in AD 9. Throughout the centuries before the Viking expansion — the emigrants from Scandinavia included Goths, Lombards, Vandals, Burgundians, Cimbri, and Anglo-Saxons. The Vikings, thus, were merely the last of a long succession of Germanic emigrants. To the 6th-century Gothic historian Jordanes, Scandinavia was the officina gentium — the “womb” or cradle of the Germanic peoples of the Völkerwanderung. Over the long run, through the interplay of competition and technological change, war and preparation for war produced the major components of European states. In the Middle Ages, a series of inventions started to make an impact on European society. The Germans acquired or perfected all sorts of metalworking techniques which were remarkable for their ingenuity and efficiency, producing special steel for the cutting edge of swords or battle-axes which was, according to Lucien Musset, unequalled until the 19th century and infinitely superior to that which the imperial arms factories were producing during the Later Roman Empire. By the time of Leif Erikson’s explorations in North America — at the turn of the second millennium (1000 a.d.) — the bulk of the “cultural DNA-structure” of Western civilization was taking shape: Latin Christendom centered around the Catholic Church (“the Ghost of the deceased Roman Empire”), science (embryonic universities), representative government (parliaments), the rule of law, a monogamous family structure based on the nuclear family, nation states and autonomous towns, citizenship rights etc. [the Normans] were at the forefront in northern Europe in introducing a monetary economy. Bishops and secular lords financed the construction of new towns with the revenues of tolls levied on trade. … The Normans were also innovators in military techniques. … After a half millennium of declining skills in architecture, economic organization and warfare, Normandy in the eleventh century was suddenly at the forefront of a technological renaissance. The ideal of winning in a fair fight, going back to the second millennium BC and known to Homer, was still held by Emperor Julian in the fourth century AD. Germanic armies, in this spirit, were ready to settle beforehand on a time and place for battle. Vandal warriors followed the same ideal when in the decisive battle at Tricamarum in AD 533 they fought only with their swords. Maurice, around AD 600, said that Franks, Lombards, and other blond peoples scorn dirty tricks. The ideal of fairness in battle, so as to show one’s true strength, also guided Beowulf in his fight with Grendel, and later still the English in the battle of Maldon. The chronicles which describe the lives of the dukes of Normandyare dominated by two themes: their success in war, and their benefactions to the Church. A subsidiary theme is their firm enforcement of just laws; however ruthless, they are never described as tyrants in the Norman chronicles. Warfare has been aptly called the national industry of the Normans, and it was as fighting men that they were most praised by their fellow-countrymen and remembered, with admiration as well as hatred, by their enemies. There thus appeared simultaneously the two conditions necessary for rapid innovation: first, the incentive to do things better, in order to stay ahead of competitors; and second, the ingredients for doing so, namely, easy access to the stock of information accumulated in the past. … [The Norman Conquest] resulted in the unhindered diffusion of a new communications technology that permitted accelerated innovation and economic growth. The ultimate beneficiaries were not just the English but rather the whole of Latin Christendom. The West had now attained a critical mass that would allow it to compete with the established civilizations of Eastern Europe and Asia. Over the long term, the Norman Conquest was perhaps the principal influence on the formation of the modern English language. The Anglo-Saxon clergyman Alcuin brought together the best existing practices to develop a standardized procedure for preserving information, thus reducing information storage costs. As Dudley points out, it is no coincidence that the Times Roman typeface is a direct descendant of the Caroline Miniscule: “The use … of titles, periods, capitalized initial letters, paragraphs, word separation and chapter breaks replicates the structure standardized by the ninth-century monks who prepared the Tours Bibles.” From a technological point of view, Medieval Europe — with its waterwheels, sawmills, flour mills and hammer mills — became the first great civilization not to be run primarily by human muscle power. It has been suggested that the Icelandic colony — from which the Vinlandexplorers emerged – was “an interesting forerunner of the American republic, having a prosperous population living under a republican government, and maintaining an independent national spirit for nearly four centuries.” The western world’s first parliament, called the Althing, was established in Iceland. It has convened every year without exception since 930 AD. Without stretching it too far, Norse Vinland and Greenland, like post-Columbian America, can also be seen as a “frontier society” (in the Turnerian sense) marked by a “dual dynamics of war and peaceful interaction … a greater freedom, feelings of self-reliance, social fluidity … and multiple loyalties”. George W. Bush certainly got this one right: “I call upon all Americans to observe this day with appropriate ceremonies, activities, and programs to honor our rich Nordic-American heritage.” Would that American Whites —inspired by the shining examples of their past — could reclaim their courageous ways and pioneer spirit.